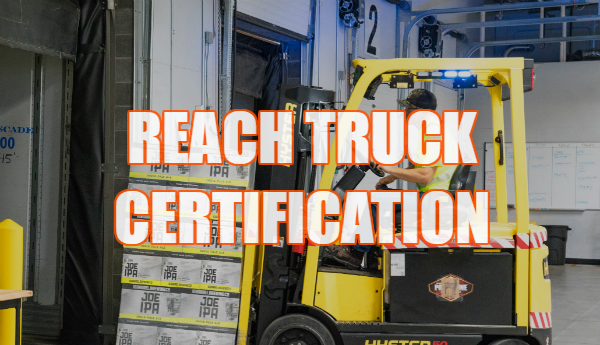 Reach Truck Certification | Complete Reach Truck Training in 1 HR! In warehouses with confined space requirements, narrow aisle configurations make it hard for traditional forklifts to operator effectively. The U.S. Occupational Safety and Health Administration (OSHA) requires that reach trucks be used in this special type of cargo handling situation. If your company needs reach truck certification or any type of reach truck forklift training, CertifyMe.net is your single source for all OSHA compliance training. From reach truck instruction to other types of forklifts, we have a comprehensive selection of courses for any size company – and any size budget. What is a Reach Truck? OSHA’s powered industrial truck e-tool covers the basics of a reach truck. A reach truck is required for narrow aisle cargo transport and material handling. Reach trucks are used for something called “high tiering,” which is basically storing and handling cargo in high tiers off the ground. Reach trucks are covered in part by OSHA standard 29 CFR 1910.178 Appendix A, which also offers guidance and standards for stability, safe forklift operation, and other crucial concepts. CertifyMe has a standard forklift training course and a Train the Trainer option, both of which include reach truck training. Operating a reach truck differs slightly than a regular counterbalance lift. The reach truck’s unique dimensions – it’s made for narrow aisle warehouses – means you have to be extra cautious in tight spaces. First, know how much space you have to work with. Many reach operators make the mistake of thinking the equipment can fit anywhere. That’s simply not the case, and you’ll learn this and other safety pointers with reach truck certification from CertifyMe.net. Next, make sure you understand your particular reach truck’s operating method. Not all reach trucks are driven the same way. Pay attention to blind spots, corners, and other hazardous areas. Make sure you don’t overload your reach truck. Follow your company’s safety guidelines. Check to ensure your reach truck is properly maintained. At CertifyMe.net, you’ll get the reach truck training necessary to help you become the safest possible operator. Safety is important for regular lifts, and it’s also critical for reach trucks as well. With our reach truck course, we’ll teach you everything you need to know – and more! Plus, you’ll have a better chance to land a well-paying reach truck job with our reach truck course. Put yourself in the driver’s seat with reach truck training at CertifyMe.net! With free lifetime renewals and full customer support – not to mention OSHA expertise you need to keep current with ever-changing safety guidelines – CertifyMe provides extensive reach truck training for every worker in your company. If you need reach truck certification, contact CertifyMe.net today! To learn more about our reach truck training program, please visit our contact page, or call CertifyMe directly at 888-699-4800. Our reach truck certification and reach truck forklift training courses are ideal for your company’s compliance requirements. With a complete selection of OSHA compliant training classes, CertifyMe.net is your reach truck training headquarters! We look forward to helping you establish an OSHA-compliant safety program today. Don’t put off your reach truck training – OSHA fines and penalties for non-compliance are costly. Sign up with CertifyMe today!